Refers to the removal of the large vein that runs down the length of a shrimp. A fork can be inserted in the back of the shrimp to pull out the vein or a knife can be used to cut a slit down the length of the shrimp. A special deveining tool can be purchased that is inserted at one end of the shrimp and then pushed up through the entire body. 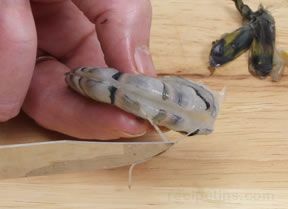 This will remove the vein as well as the shell.